The International Association of Athletics Federations (IAAF) recently concluded that Pistorius’s artificial legs give him a decided advantage over athletes who run with naturally endowed legs. He is using what they have termed a “technical aid.” Subsequently, Pistorius is not eligible to compete at the 2008 Olympics should he qualify. Pistorius sees this as a form of discrimination. He argues that his sprinting talents are latent and the result of his hard work and dedication to the sport. “There’s a fear of change,” he says. That said, the IAAF has a point. Pistorius’s artificial legs have been dubbed ‘cheetahs’—and not by accident. 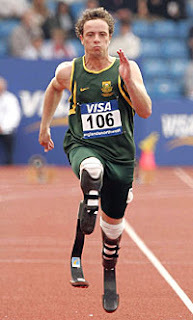 They resemble blades more than feet, allowing Pistorius to take long strides as he springs from step to step. Some claim that his strides are as long as three to four meters. This is no attempt to mimic normal human running; it’s a new form of locomotion altogether. Pistorius and his team argue that this is nonsense, that the blades couldn’t possibly offer such an advantage. The Pistorius issue is a case in point. The IAAF was compelled to created a new rule stating that “the use of any technical device that incorporates, springs, wheels, etc is forbidden.” They argue that these endowments change the nature and spirit of sporting events to an unacceptable degree. This is undoubtedly a precursor to future rulings that may ban genetic modifications, cognitive enhancements, and cybernetic implants. But there is something inherently unsatisfactory about all of this. A certain arbitrariness exists when it comes to determining which technologies are acceptable and which are not. Moreover, given the strong likelihood that advanced prosthetics will greatly surpass what is natural, at what point do we concede defeat and allow ‘cyborgs’ to compete alongside ‘naturals?’ Are groups like the IAAF discriminatory by insisting that para-athletes conform to ‘normal’ human morphology? And given the ‘arms race’ nature of competition, will these positional advantages cause athletes to do something as seemingly radical as having their healthy natural limbs replaced by artificial ones? Is it self-mutilation when you’re getting a better limb? The long term impact of enhancement in sports, however, is still unclear. There may be schisms within specific sports causing the emergence of rival leagues. There may be leagues for enhanced athletes and those for ‘naturals.’ Over time, however, the naturals will increasingly appear anachronistic. Eventually, performances by cyborgs will surpass those of unaugmented humans. It’s the disabled, after all, who will inherit the earth.